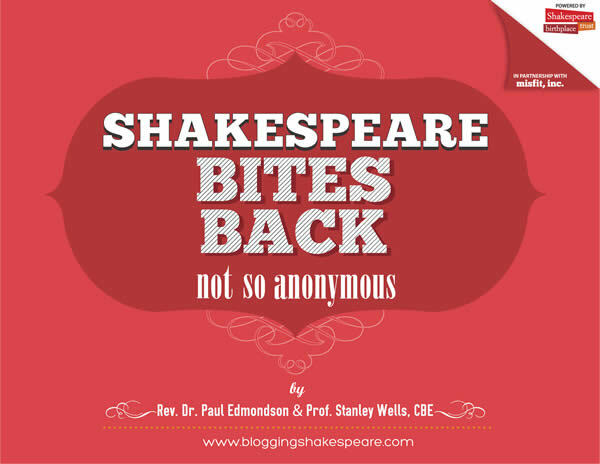 Prof Stanley Wells and Dr Paul Edmondson published a free ebook today Shakespeare Bites Back: Not So Anonymous – partly in reaction to the discussion kicked up by the film Anonymous. Reports of his death having been greatly exaggerated, the author has made a spectacular return in English studies. This is the first book devoted to medieval and early modern authorship, exploring continuities, discontinuities, and innovations in the two periods which literary histories and institutional practices too often keep apart. Canonical authors receive sustained attention (notably Chaucer, Gower, Shakespeare, Jonson, Milton, and Marvell), and so do key issues in the current scholarly debate, such as authorial self-fashioning, the fictionalisation of authorship, the posthumous construction of authorship, and the nexus of authorship and authority. Other important topics whose relation to authorship are explored include adaptation, paratext, portraiture, historiography, hagiography, theology, and the sublime. Ethical Poetry, Poetic Theology: A Crisis of Medieval Authority? Cardiff University’s Elizabeth Ford, Johann Gregory and Étienne Poulard have just returned from the SAMEMES medieval and early modern authorship conference in Geneva. “We had a tremendous time in a warm sunny Geneva. The conference was a great success with prestigious plenary speakers and high quality panel sessions. The Cardiff Shakespeare panel went well, with the likes of Patrick Cheney, Katherine Duncan-Jones, Lukas Erne, Lynn Meskill and others in the audience. Thankfully Andy Kesson provided his usual solid support in the chair. The conference included an enjoyable conference dinner and trips to Le Musée de la Réforme and La Foundation Bodmer, a collection which included a wealth of books including a Shakespeare First Folio. Geneva supplied friendly company, tastey food, cold beer, and a crystal clear lake for swimming! Elizabeth Ford, Johann Gregory and Étienne Poulard from Cardiff University will present papers this week in Geneva. The SAMEMES conference is entitled ‘Medieval and Early Modern Authorship’. The event will be hosted by the University of Geneva on 30th June – 2nd July 2010. Their panel will be chaired by Dr. Andy Kesson (University of Kent). This panel has been accepted for the SAMEMES conference entitled ‘Medieval and Early Modern Authorship’. The event will be hosted by the University of Geneva on 30th June – 2nd July 2010. Elizabeth Ford has just returned from the Renaissance Society of America conference in Venice where she presented a paper entitled ‘Will Kemp’s threat to Romeo and Juliet‘. Dr Joseph Sterrett (Cardiff University alum.) co-organised a panel at this conference entitled ‘”Thou Pray’st Not Well”: Prayer in performance and society in the Renaissance’. This included his paper ‘Outpraying Prayers: Competitive prayer in Shakespeare’s Richard II‘.